Mike Ullery | Miami Valley Today Miami County Commissioner Greg Simmons addresses chamber members and officials at Tuesday’s State of the County luncheon at the Piqua Country Club. 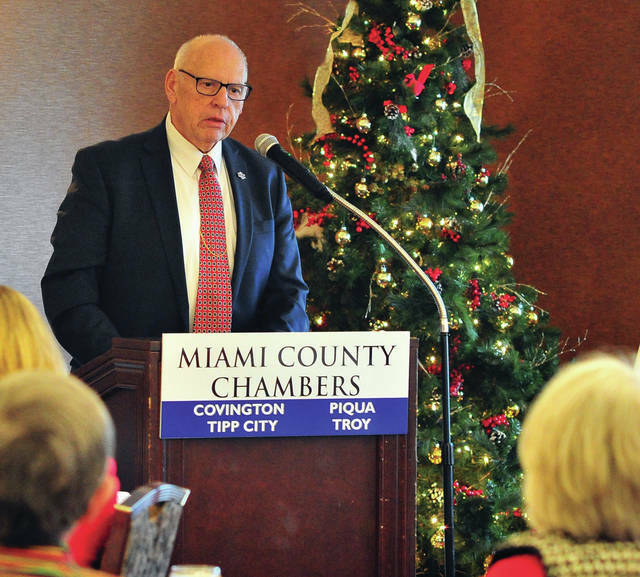 MIAMI COUNTY — At the annual State of the County luncheon, the Miami County Commissioners said the county’s finances are in “pretty good shape” and announced the creation of an economic development corporation. The event was hosted by the county Chambers of Commerce at the Piqua Country Club. Thanks in large part to elected officials in the county, Commissioner Jack Evans said the county’s finances are sound. Evans said that the elected officials “have been really good” in working with the commissioners on the county’s 2019 appropriations. “I don’t think we’re going to see a huge increase. There will be some we have to review, but, on the whole, it’s going to be pretty good,” he said. Commissioner John “Bud” O’Brien announced the creation of an economic development corporation separate from county government. It would have its own board of directors, officers and code of regulations, he said. “The establishment of this ED corporation can and would benefit the entire county and would not infringe upon the current economic development efforts already in our cities,” O’Brien said. The corporation would have several main areas of interest, he said, including leveraging funds for infrastructure improvement projects, marketing and outreach, strategic planning regarding the Dayton airport, workforce development and business retention and expansion. Department of Development Director Rich Osgood studied the development efforts of 26 other Ohio counties and came up with a proposal for the corporation, O’Brien said. Funding for the corporation would be generated by property sales conveyance fees, which O’Brien said could generate between $600,000 and $700,000 a year. The Miami County Department of Development is also eyeing expansion of its building inspection services into more counties in the future, O’Brien said. It currently provides services to Darke, Mercer, Shelby and Auglaize counties. The department is in preliminary discussions with Allen, Butler and Van Wert counties. “We are already the second-largest building regulation department by geography in the state of Ohio,” he noted. O’Brien also unveiled a proposed design for the renovation of the courthouse plaza, a project he has wanted to tackle since his election to the board in 2006. The project was derailed by the recession, but the commissioners have been working with Garmann Miller Architects on a new design for about 18 months, O’Brien said. The most recent site plan features one fountain, which will be moved to the front of the courthouse, walkways with pavers that mimic the floors inside the courthouse, and more green space. Previous designs ranged in cost from $1.6 million to $3.2 million. A cost for the most recent design is not yet available. Evans also touched on some of the county’s “behind the scenes” efforts, including facility maintenance and sanitary engineering services like document shredding and household hazardous waste disposal. The county completed a full replacement of the fire system at the incarceration facility and replaced one of the chillers at the Safety Building. The county also plans to replace its outdated phone and data system, he said. Commissioner Greg Simmons provided an update on the county’s veterans services, the Miami County Sheriff’s Office and the courts. Miami County Veterans Services used half of its allocated budget this year and returned the rest to the county, Simmons said. According to Simmons, the office increased transportation to the VA Hospital by 20 percent, began offering budget classes to veterans and established a new position to increase social services. Next year, the office will be sending representatives to spend time with veterans in nursing homes. “A lot of the veterans there are by themselves, they don’t get many visits,” he said. The visits will remind them that they are appreciated, he added. Simmons noted that Prosecutor Tony Kendell and Assistant Prosecutor Paul Watkins have been certified to prosecute local federal crimes. He added that the civil division has been able to collect $2.5 million in back taxes. He credited the Miami County Sheriff’s Office with bringing in $500,000 in revenue by renting out space in the incarceration facility to the U.S. Marshals Service and other counties. He added that the department is also working to update its security. Simmons also said that the Sheriff’s Office plans to buy a new drone, which will have thermal imaging, and can be used in searches and rescues, and at crime and accident scenes. The department’s school resource officer program continues to expand, which Simmons called “vital” to school safety and crime prevention education. https://www.dailycall.com/wp-content/uploads/sites/30/2018/12/web1_120418mju_pacc_stateofcounty.jpgMike Ullery | Miami Valley Today Miami County Commissioner Greg Simmons addresses chamber members and officials at Tuesday’s State of the County luncheon at the Piqua Country Club.